In the field of English teaching many opportunities exist for TESOL Teachers to help students reach their academic English goals. By teaching for the IELTS and TOEFL examinations you can take advantage of this well sought after area of professional language teaching. 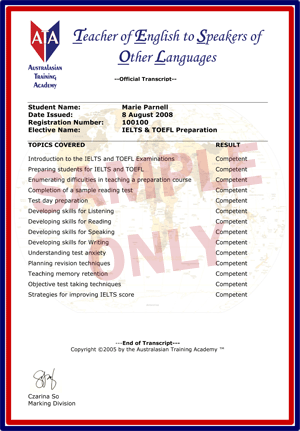 what are the IELTS and TOEFL examinations? This course will acquaint the TESOL teacher with both examinations and how best to prepare students for taking them. IELTS and TOEFL preparation will delve into study methods, cramming, the four language skills covered in the exams and how best to prepare activities and lessons in the ESL preparation course classroom. Full of example test components, resources and activities this course will thoroughly prepare the TESOL teacher for this academic area of ESL teaching. Q: Will I need to complete a TOEFL exam in order to teach one? A: Part of this course is the completion of part of an actual examination to give the TESOL Teacher a firsthand look and understanding of the test itself and completing it. Q: How long do students usually study IELTS and TOEFL preparation courses for? A: This course will cover the study timetable and schedule for IELTS and TOEFL preparation teaching.